Tipbet haven't money for to pay customers! Then I was now with 522,56€. I asked a withdraw and when the finance team would must to remove only the extra 19,56 (because with the bonus I wins 119,56 but the maximum is 100,00) then this team wrong and removed 464€! Absurd! I am being stoled by Tipbet, I am fully disappointed and frustrated with it. I have all print screen of my thousands bets done for long days there. And the prove evidence of page bonus (https://i.postimg.cc/B678R8PR/bets-with-bonus.jpg) proving they would must to remove only 19,56 and not 464! Last edited by Samuel; 02-11-2019, 04:35 PM. DANGER! This company is SCAM! They stoled my money. They only accept deposits and not pay winnings of customers! The worst bookmaker/casino which can to exist. I recommend this for nobody. Never you must to choose Tipbet for to register and place your money there, or you will to be playing without possibilities of to have profit and win money. DANGER! This is patetic, stupid, idiot way of to think and work! This not exist in any other bookmaker! This is full steal money of customer! The way more desonest of to steal winnings of one honest customer! Without any reason logical! 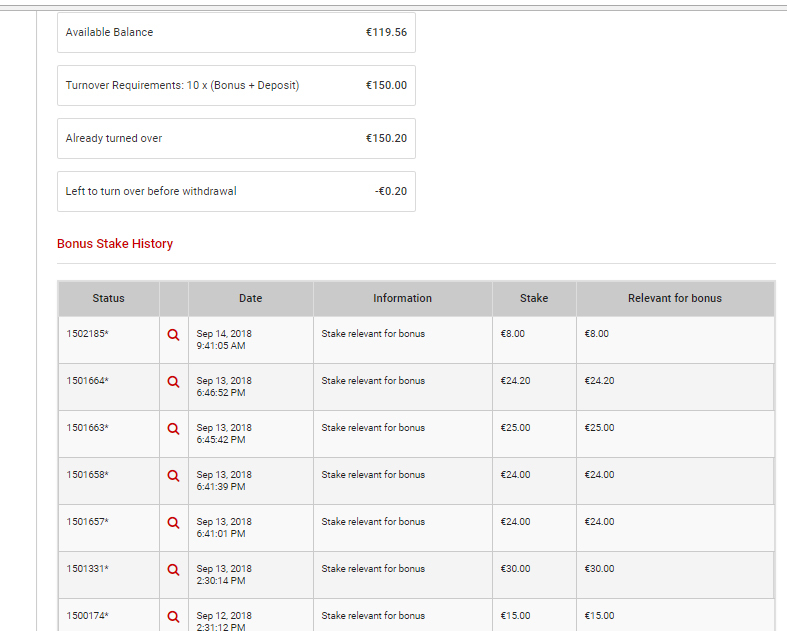 When I finished the rollover, with a balance of 119.56, I did not withdraw, because at the moment my account has stopped being bonuses and has become real money, am I right? "When you finish the bonus rollover, do not make any more bets! Make a withdraw by withdraw, wait 2 days to receive the money, and only after receiving it, deposit the amount back into your account and start playing again"
I'm sorry if you believe this is something honest and plausible. It's not even close! Have to withdraw, expect to pay, to re-deposit! No, not so, logic says no. They're just making this up right now, not to pay! I'm afraid not,Samuel.Bookies tend to have rules covering this,which say that you have to turnover your bonus a number of times before you can make a withdrawal.If you fail to fulfill the bonus conditions,they tend to say that any profits emanating from the bonus [even indirectly], are void.It can be very difficult to show which profits emanated from the bonus,and which came from your original deposit.Bonuses and their conditions can be cunningly constructed traps. Sorry,Samuel,I should have read your entries more thoroughly.Let's hope BMR can help you. How do you really feel?? Any word if you got paid? They ignore me yet. I was promised a few days ago that I would come here on the reply topic, but so far they have not come to any of the forums where I posted the case. That is, they feel ashamed for having stolen me and do not have the least amount of time to come here to discuss publicly and to present arguments. They know I'm right.